Bad performace in cluster.What is wrong? Recently we have made small test of Infinispan performance in a cluster and we have had got very bad performance andI have no idea what is wrong. For one node we get about 50-100 thousands of put per seconds what is very good result bu when we add at least one more node (on the same serverer) performance is about 1-3 thousends per second We make test on Core2Duo and we are usng Infinispan 4.1. 1. Re: Bad performace in cluster.What is wrong? maybe it is normal write performace, and I expect to much Read performance is very good about 400 thousands get per second on each node. 2. Re: Bad performace in cluster.What is wrong? 3. Re: Bad performace in cluster.What is wrong? You can take our cache bench framework and run on your deployment target. Capture results and report back. Having everyone making their custom performance tests leads to inconclusive results and therefore conclusions. P.S You really node at least several server machines in order to do any decent testing. 4. Re: Bad performace in cluster.What is wrong? Are you talking about http://infinispan.blogspot.com/2010/02/benchmarking-infinispan-and-other-data.html ? If yes for 2 nodes people get 3700 op/sec what is not huge value. I will try to start it on our server. 5. Re: Bad performace in cluster.What is wrong? Yes, try it out on 8 servers, or whatever your planned deployment configuration is. That way you will be able to calculate limits of your setup and will not what performance to expect once your application is ready. 6. Re: Bad performace in cluster.What is wrong? so far we will deploy infinispan on 2 nodes it will be use as cache and replication solution for object that store session information (like credential, information about user it will reduce number of request to DB) for our SOAP WebServices. We will use load balancing and it is a reason why we want to synchronize object in Infinispan between two nodes. 7. Re: Bad performace in cluster.What is wrong? 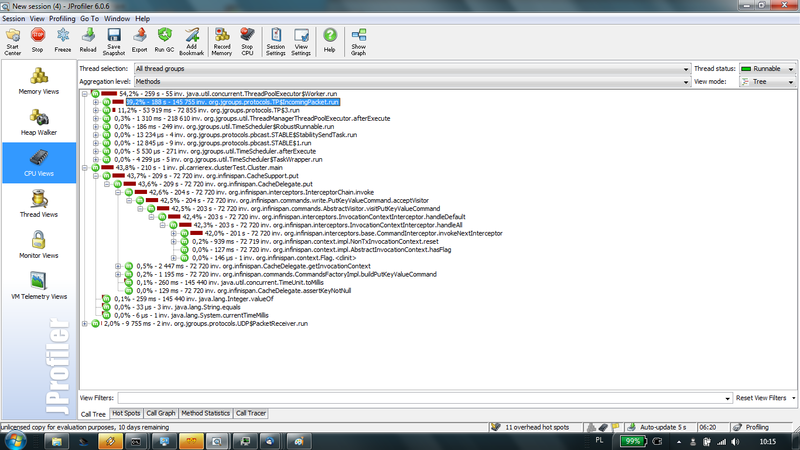 I'm still waiting for configurationour internal network to perform performacne test using benchmark tool. In meantime I've looked at http://www.jgroups.org/perf/perf2008/Report.html and I still do no understand why in Infinispan on one node performance is about 1000msg/sec but using JGroup it is about 60000 msg/sec 1KB even when I use 4 node (it is our test) I understand that JGroup is only mechanism for communication but it is hard to belive that infinispan waste so much time in inserting data to Cache. 8. Re: Bad performace in cluster.What is wrong? Are you using the same JGroups configuration for both? It's hard to say right now, but if you hook a profiler and run your tests, you'd see where time goes. No speculation beats the result of a profiler . I've used JProfiler in the past and it's well worth the money although there's others out there. 9. Re: Bad performace in cluster.What is wrong? there is default configuration, I've described our short test in http://community.jboss.org/thread/157354 you can test in your environment because it is very short program. What do you mean by good performance? I've spent a lot of time to find Infinispan benchmark results but I've found only result on Infinispan blog and results were twice better than ours what is not big difference. 10. Re: Bad performace in cluster.What is wrong? I've run test on two Windows machines and we get 1000-1500put/s in this test CPU load was around 10%. The same test I've started on JProfiler (in this scenario load was 70-80% but it was generated by jprofiler). In attachment you can see results. 11. Re: Bad performace in cluster.What is wrong? I've lost my hope to find a cause of poor performance and we switched to HotRod. By the way with many caches in cluster (and manymodification) we had many error with locks.